The Union of Small Cities and Towns is the first in Russia alliance of small cities and municipalities. The Union was created in 1991 as a result of economic reforms and democratization of the Russian economy and society. The Union of Small Cities and Towns of the Russian Federation comprises small and medium-size cities, towns and regions with population under 200 thousand inhabitants. They are represented by the leaders of local administrations and municipal units. The act of incorporation of the Union was supported by the Parliament of the Russian Federation. As an alliance of local municipalities, the Union is an independent non-profit organization, unaffiliated with government or political circles. The goal of the Union is to identify and solve problems of small cities and municipalities on the federal level. Such partnership is of vital importance to small cities and municipalities due to their unique social, economic, and political position as well as by their organization structure and their level of infrastructural development.
. In the course of its activity, the Union identifies common problems and ways to solve them, unites the efforts of small cities and their administrations in order to create proper conditions required for their comprehensive economic and social development. The Union’s goal stems from the need to strengthen the role of small cities as a unique category of municipal structures in the process of development and adoption of decisions that define the future of the Russian Federation. Acting upon the federal policy regarding the separation of responsibility between the levels of the government and their financial independence, the Union is particularly concerned about the problems of economic, social and cultural development of small cities and municipalities as well as about bringing up these problems among government leaders, branches of parliament, mass media, business and other communities. The Union of Small Cities and Towns is one of the founders of the modern system of local self-governance. The members of the Union, heads of the cities, together with federal agencies, jointly developed the 8th chapter of the Constitution of the Russian Federation and key federal laws that address the organization of self-governance in Russia. They became constant and active participants of parliament hearings in the Duma and the Federation Council. 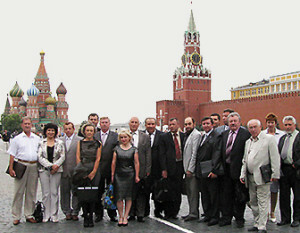 Together with the Government of Russia, the Federal Assembly, the European Congress of Local and Regional Authorities, the Union held forums, meetings, conferences and other events, directed to the development of small cities and the adoption among them of the principles of local self-governance, reported to the federal authorities on the state of self-governance in small cities. Previously, in the 90-s, the President and other members of the Union were members of Councils of local self-governance and Social Chamber with the President of Russia. The Union has developed and directed to all federal authorities proposals to create a complex of terms required to the development of small cities. The proposal included such important issues as budget provisions, municipal property, functions of government agencies and others. The Union prepared a document “concerning the immediate action in the realization of constitutional principles of local self-governance and the objectives of the federal governments of subjects of federation regarding the reformation of local self-governance”. The Union addressed this document at the All-Russian meeting concerning the issues of realization of constitutional principles of local self-governance and the organization of government authority in the subjects of the Russian Federation in Moscow in 1995. The Union initiated and developed the bill “of the principles of municipal service in the Russian Federation”. Together with the State Duma the Union worked on the bill “about the industrial landmark enterprise”. The Union regularly directed its proposals into the plan of lawmaking activity of the Parliament of the Russian Federation about the development of legislative acts, necessary for the realization of the law “about the general principles of organization of local self-governance in the Russian Federation”. Thus, in 1997, the Union presented a total of 21 bills. The representatives of the Union were members of the work groups created by the Ministry of Economy of Russia in order to develop a Federal program of government support to local self-governance and to prepare federal minimum social standards. Among the legal documents developed by the union, an important role played the “Indicative Certificate of Incorporation of a Small City”, which became the base of normative legal acts of many small municipalities of Russia. The Union was the first in Russia to address the issues of underdevelopment of small cities compared to large cities and metropolitan areas, inequality of development conditions and opportunities for population between small and large cities. The Union presented detailed information about the most critical problems of small and medium-size cities to the Administration of the President of Russia. Besides its participation in the development of legislative acts, the Union developed and directed into the Government of Russia a large number of solid recommendations concerning a wide range of issues of their reformation and development. At one of the plenary sessions the Union adopted and directed to the Chairman of Congress a document “regarding the correction of the economic policy of the government taking into account the peculiarities of small and medium-size cities of Russia”. A number of proposals within the document were reflected in subsequent decisions of the federal government. The Union undertook the development of the concept of “Key statutes of the government policy of stable development of small and medium-size cities of the Russian Federation”. The Union contributed into the 2001 plan of lawmaking activity of the Parliament of the Russian Federation and the State Duma about 30 proposals, approved by the All-Russian meeting “concerning the government policy of the development of small and medium-size cities of Russia in light of economic reforms” organized by the Union. “A Federal complex program of the development of small and medium-size cities of Russia in light of economic reforms” is a result of hard work of the Union and the members of its Council together with the Parliament, ministries and departments. The Program was approved by the Parliament of the Russian Federation in 1996. The decree of the President stated: “to make special mention of the significant role of the Union of Small Cities and Towns of Russia in the development of the project of the program”. For the initiation of the development of this document, the Parliament decided to transfer a number of functions of the Governmental customer of the Program to the Union. According to the decision of the Parliament, the President of the Union became the head of the Work Group with the Gosstroy of the Russian Federation to coordinate the realization of the Program during the period 1996-2001. Stemming from the need to find a solution to the mid-term objectives established by the President of Russia, namely to double Russia’s GDP and reducing poverty, the Union initiated the development of a special “Federal program to double the GDP and reduce poverty in small cities of Russia”. The concept was revised according to comments by the Ministry of Regional Development of Russia and directed to the core committees of the Federation Counil. The project developed by the Union was supported by the leaders of numerous subjects of federation and small cities of different regions of Russia. Based on this framework, the project of the Program is being developed. Together with the subjects of federation, the Union arranged an experience exchange program between the small cities. Certain discussions of strategic questions of the development of small cities took place and solid recommendations to the administrative agencies of all levels were approved in the context of the work of the Ministry of Regional Development of Russia. The members of the Union actively cooperate with corresponding federal agencies and the Social Chamber of the Russian Federation to implement the National Projects and, in particular, the development of health care infrastructure in small cities and regions. Since 1992, The Union of Small Cities and Towns has developed key partnerships with international organizations and unions of local self-governance – the Congress of the Local and Regional Authorities of Europe, European Economic and Social Committee of the United Nations, the Council of European Municipalities and Regions, International Union of Local Authorities, functional organizations of the European Council and the European Union. In 1994, the President of the Russian Federation issued an instruction to form the 1st Russian delegation for the session of the Congress of the Local and Regional Authorities of Europe, which included the members of the Union. The President of the Union became the 1st Russian representative at the Congress. Today, the Union is arranging experience exchange between the authorities if small cities and regions to implement priority national projects, developing proposals to modify 131-F3, implementing joint projects for the economic, social and cultural development of small cities, initiated by their leaders. The Union of Small Cities and Towns has been active for 19 years so far, during which it contributed a lot into the development of Russia’s regions. The goal of the Union is to raise the development level of small cities and municipalities to the level of large cities and metropolitan areas. Since its foundation, the Union made a priority to closely cooperate with the administrations and societies of small cities and to represent and defend the interests of their inhabitants on the federal level in conjunction with federal agencies and institutions. В большом зале Дома ученых Российской академии наук в Москве 12 апреля 2019г. в рамках Конкурса «Менеджер года в государственном и муниципальном управлении» в торжественной обстановке была проведена церемония награждения победителей Конкурса. В столице Дагестана городе Махачкале, в Доме дружбы, 18-19 апреля проходит первый в этом году форум «Сообщество» Общественной палаты РФ. Тема дискуссии активных граждан и экспертов – «Экономика труда. Рабочие места. Занятость». Такое заявление он сделал 15 апреля на заседании попечительского совета общественного формирования, которое состоялось в Российской академии народного хозяйства и государственной службы (РАНХиГС) при Президенте РФ. Высшие учебные заведения, расположенные в малых городах и в сельской местности, являются по сути системообразующими структурами в небольших муниципалитетах, а потому заслуживают поддержки от органов государственной власти и местного самоуправления на территориях присутствия. Представители Союза малых городов РФ 24 апреля 2018 года приняли участие в семинаре-совещании Комитета Совета Федерации по конституционному законодательству и государственному строительству на актуальную для многих малых городов тему «Социальная адаптация и интеграция иностранных граждан в Российской Федерации: состояние, проблемы и перспективы».